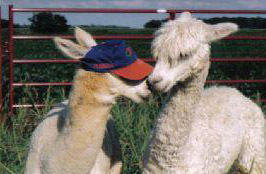 Openherd: Amsterdam Alpacas is a farm located in Anna, Ohio owned by Tim and MarNell Schmiesing. We have an alpaca for you! Our prices range from $200 and up and we have a wide variety of colors and ages to choose from. Take advantage of our package deals (or create your own package) and save! We take pride in the many top-of-the-line quality bloodlines that we have in the lineage of our alpacas. These include: Black Magic, Bueno, Dakotia, Matador, Royal Fawn, Grand Master, Kilyo of Star Hill, Yupanqui, Peruvian Dante, Fire-N-Ice, Nic Nac, Silvio, Camelot, Augusto, Caligula, Wily Coyote, Pride of America, Don Timbo, Don Quijote, El Nino and White Out! We are a small farm nestled in Shelby County, Ohio. We went to the Ohio Alpacafest for a family fun day in the fall of 2000, and everyone in the family fell in love with these beautiful animals! I must say we were leery about spending the initial investment; but after two years of researching, we finally bought 4 Huacaya females and 1 Huacaya male. 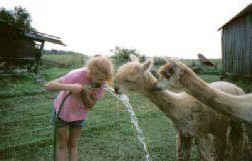 We took the next 6 months to prepare the shelter and fencing and brought our alpacas home in June of 2003. This has been a very rewarding experience for our family. My husband and I and our two sons & two daughters have all been involved in the raising, showing and handling of our herd of alpacas. Our goal from the beginning has been to continue to improve our herd as we grow by breeding to top quality herdsires. Purchase price to be paid in full upon delivery of alpaca. 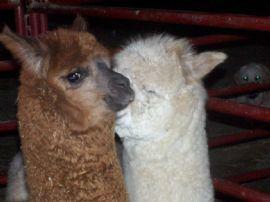 We are liquidating our alpaca herd. Take advantage of our deeply discounted prices!! !